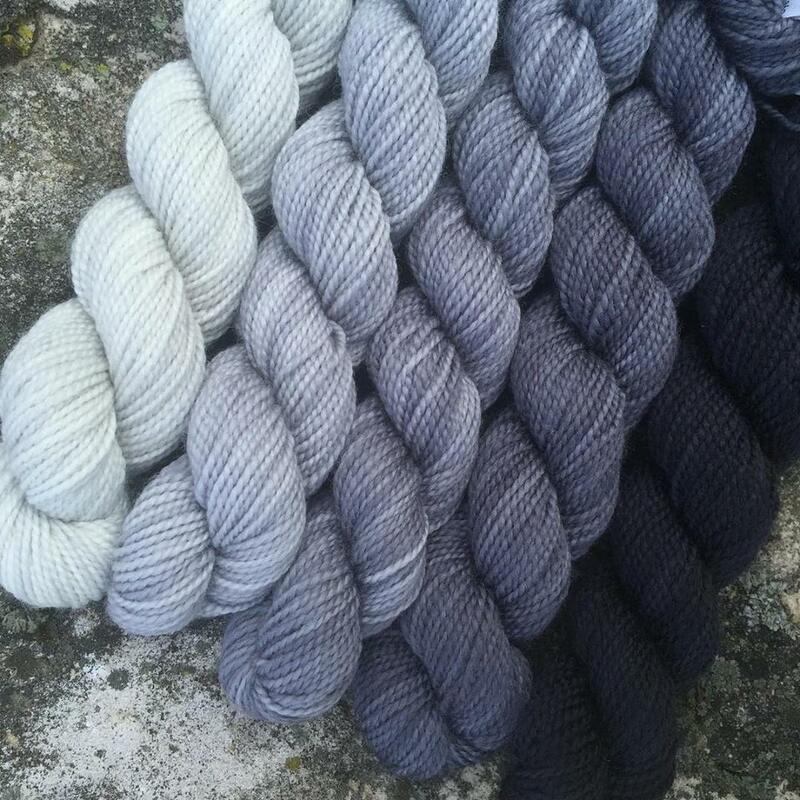 Does Yarn Color Have A Shelf Life? I’ve decided it’s time to get in touch with my “inner yarn self” and make some important decisions regarding my collection. Instead of consuming, I want to use what I’ve collected over the last 20+ years. 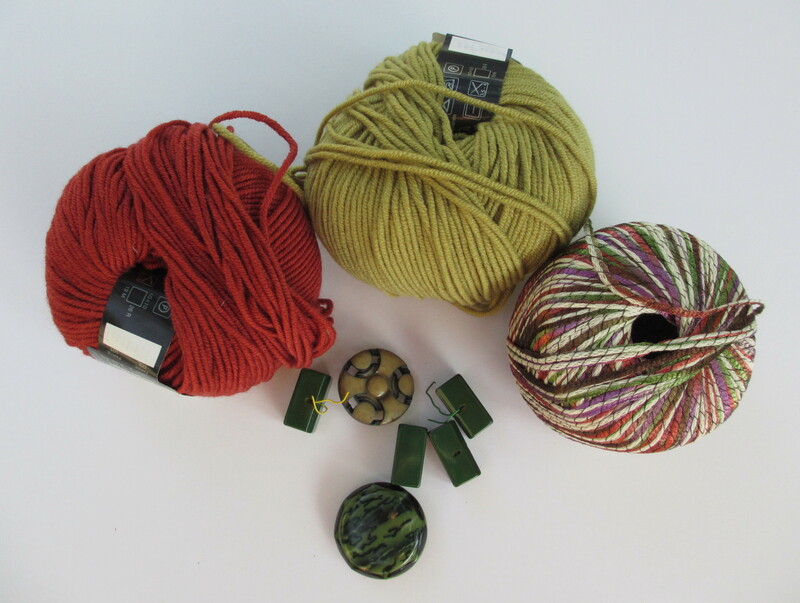 Do I find the yarn colors, fiber content and gauge still appealing? I uncovered enough gold-colored Lana Gross Merino Big for a sweater and questioned why I purchased the particular color, because I don’t wear gold (jewelry is an exception). I soon remembered, the yarn was purchased for my daughter whose reddish-brown hair and green eyes definitely suit the color. But, what about all the rest? Are the many skeins, balls and hanks of color still relevant? Some may be considered vintage, but does yarn color have an expiration date? I collect vintage knitting patterns, e.g., Coats & Clark’s featuring Red Heart Books, Spinnerin, Woman’s Day, to name a few, but I don’t have an interest in knitting from the various collections. I’m interested in the recorded history of style and written directions, in order to compare and evaluate the patterns of today. Now, I’m knitting “A casual classic from designer Calvin Klein” pullover in a broken-cable pattern from Vogue Knitting Very Easy Knits. 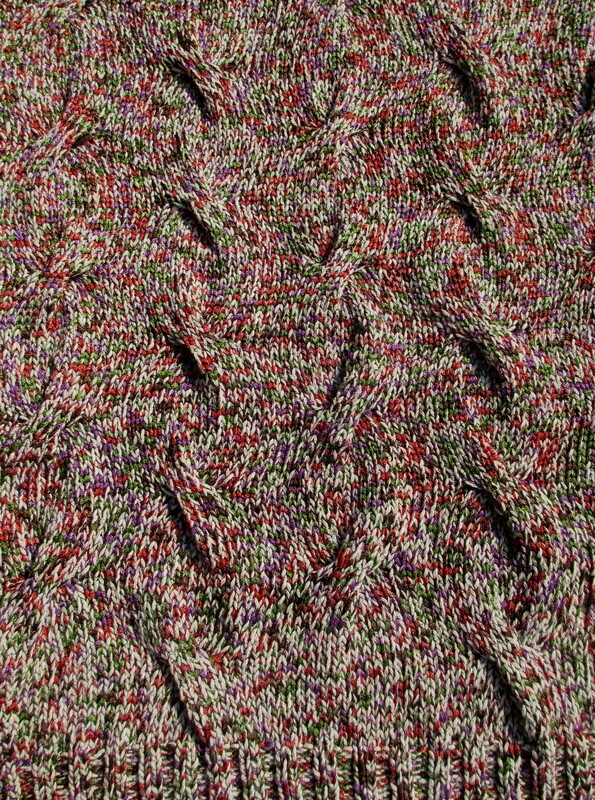 The Broken-Cable Pullover first appeared in the Spring/Summer 1986 issue of Vogue Knitting and was originally knit using Joseph Galler Bamboo. I’m knitting with Berroco Zodiac 53% cotton, 47% nylon yarn which may be at least 10 years old. Looking for answers, I decided to check-out the Pantone Colors for Fall 2015. Of course, these colors dominant the Fashion Industry, but what about the yarn industry? 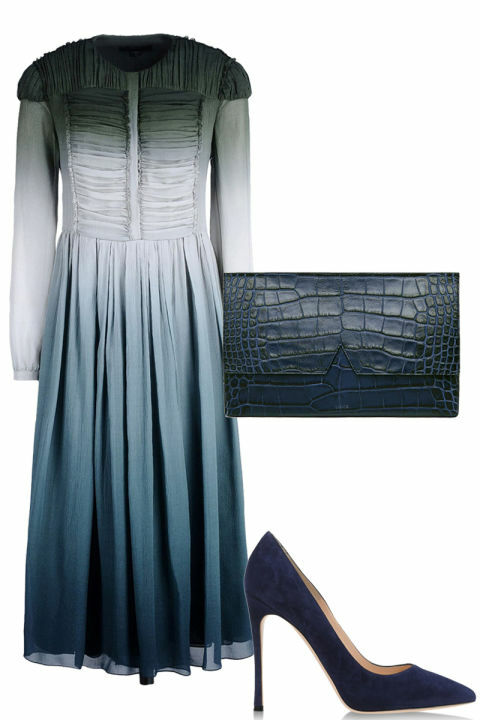 The Burberry dress, “The Reflecting Pond” found on Harper’s Bazaar online http://www.harpersbazaar.com/fashion/trends/g5257/pantone-top-color-trends-fall-2015/?slide=4 definitely resembles Pantone’s Stormy Weather and Reflecting Pond. Pantone’s Stormy Weather and Reflecting Pond along with Grey Skies Gradient from Koigu have common color attributes. Koigu and the designer dress from Burberry share the effects of color gradation. 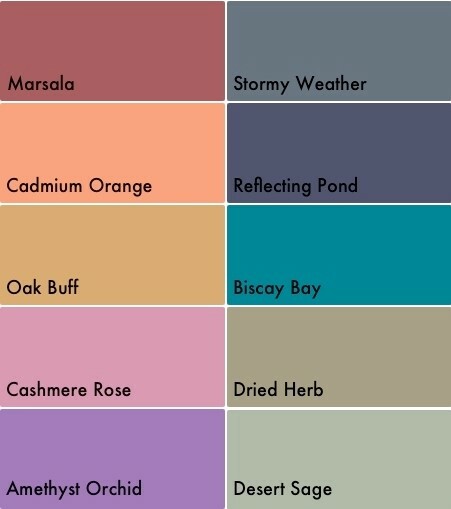 Pantone’s forecasts are fun for Fashion Week and merely a suggestion. Color preference is literally in the “eye and mind” of the beholder. Yes, girls like pink and practically everyone likes blue, researched by neuroscientists, Anya Hurlbert and Yazhu Ling at Newcastle. The results from their color selection experiment, Study: Why Girls Like Pink appears in Time Magazine August 20, 2007. I believe my color selection is based on my life experiences which reflects the various stages of my personal growth. So, I’ve decided to let my yarn color selections tell my story in bright, vivid, bold details. I also wanted to mention, I find it very interesting how colors do seem to appear, disappear and reappear in our lives. Yes, it’s true, we do have our preferences don’t we? Have a wonderful week of color. Thank you for your insightful comment. It’s amazing how color speaks our truth. This is interesting–when I look back at quilts I made 15-20 years ago, I can see ways that some reflect colors that were popular at the time. On the other hand, the first quilt I made is remarkably similar, in color, to one I made recently with colors that seem “evergreen” in my life.